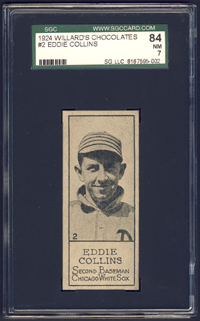 As Connie Mack's on-field manager, Eddie Collins led the Athletics to four pennants in five years. Traded to the White Sox, he helped that club to two more. 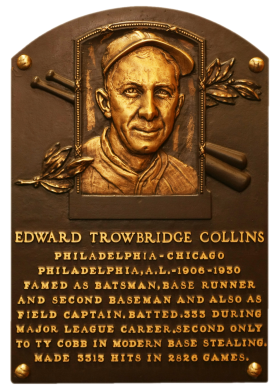 An accomplished all-around ballplayer, Collins smacked 3,310 hits for a career average of .333, yet never won a batting title. A consummate basestealer, he ended up with 743 career swipes. "Cocky" scored 1,818 runs and drove in 1,299 runs in his 25-year career. Comments: In May of 2000, I purchased a group of 1960 Fleer PSA 8s from Vintage Sports Investments via their website - G. Alexander, H. Heilmann, H. Jennings, H. Newhouser, W. Hoyt and E. Collins. They were temporary placeholders until I found a contemporary portrait card issued during their careers. In July, 2004 I purchased a T206 PSA 4 to replace the 1960 Fleer card. Then, I replaced the T206 with a E90-1 American Caramel SGC 40 in April, 2005. I remember not liking the card - his head was so small in the picture and it looked weird. In February, 2007 I found a GAI 6 1924 V122 Willards on eBay and won it. It was the perfect mugshot. 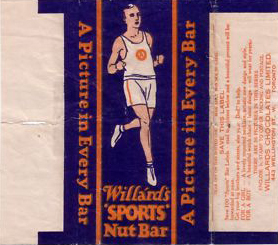 On June 5, 2008 I won an auction for a beautiful raw Willard's Chocolate card on eBay from seller Bryan Sagar (bsaygr). I remember requesting high resolution scans and thinking how beautiful the card was; hoping the item had not been trimmed. Willards was produced in Canada, and the seller resided in British Columbia, Canada so I knew the card had a great chance of being authentic . 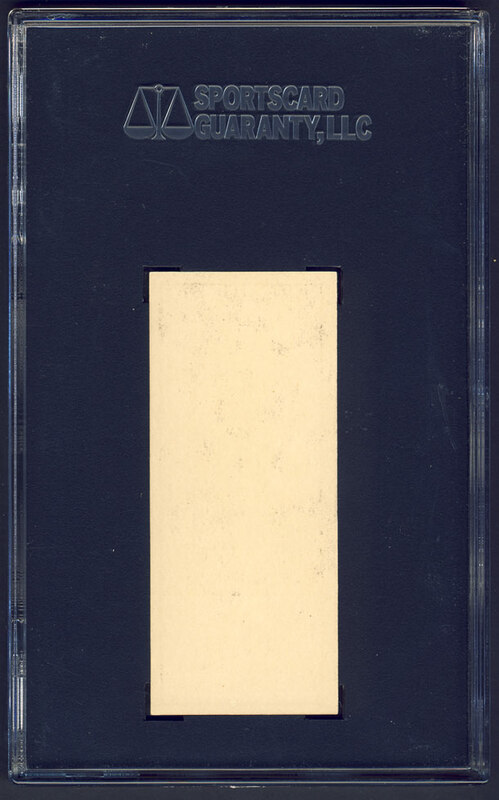 At the National in Chicago my thoughts were confirmed when SGC slabbed this beauty NM 84! This is one of the best "raw" buys I've ever made. I also believe it's the highest graded copy in existence. Description: Three baseball players are featured among the 56-card Canadian set. 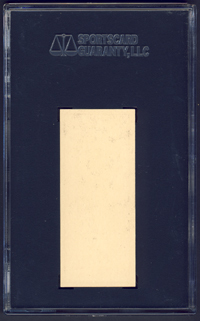 The black-and-white cards are printed on thin paper measuring 1-3/8" X 3-3/8". Backs are blank. The set features male and female athletes from many different sports, with a distinct Canadian flavor. The candy company was headquartered in Toronto.